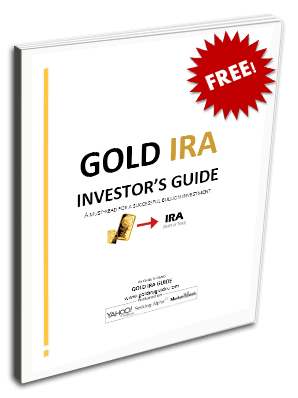 Gold IRA GuideGold Does gold make sense in an IRA? This deep study aims to answer that question. Does gold make sense in an IRA? This deep study aims to answer that question. When the Individual Retirement Account (IRA) was created by Congress in 1974 Gold was one of several investments defined as “collectibles” that were prohibited from inclusion. That changed with the Taxpayer Relief Act of 1997. Since then there is no prohibition on an IRA owning Gold. There are restrictions, but the fact is that an IRA, a SEP, and a SIMPLE IRA can all make investments in Gold (Source: Internal Revenue Service, Publication 590-A). There are no reliable statistics available quantifying the number of IRAs that have made investments in Gold since the restriction was lifted. Likewise, there is no available data on the percentage of IRA assets invested in Gold. According to a survey conducted by Gold IRA Guide, 64% of those surveyed were not even aware that one could make such an investment in an IRA (Source: Gold IRA Guide, Owning Physical Gold Through an IRA: Survey Reveals 64% of Americans Don’t Even Know It’s Possible, October 14, 2016). According to the Investment Company Institute (ICI), there were some $7.4 trillion dollars invested in IRAs as of the end of 2015. Of that amount, ICI estimates that less than 2.5% may be invested in Gold and other unidentifiable assets (Source: Investment Company Institute, Ten Important Facts About IRAs, August 2016). So, does including Gold in an IRA make sense? That’s what this paper sets out to answer. To do this, we back-tested three traditional asset allocations along the spectrum from Conservative to Aggressive and then added Gold to these portfolios and studied those results. Our three baseline portfolios are comprised of US Stocks, 10-Year Treasuries, and Cash/Money Market Funds. The allocations shown in Figure 1 below define a “Conservative” portfolio as holding 10% of its assets in US Stocks, 80% in 10-Year Treasuries, and 10% in Cash/Money Market Funds. Figure 1 also defines a “Moderate” portfolio as being made up of 35% US Stocks, 60% 10-Year Treasuries, and 5% Cash/Money Market Funds. The mix for an “Aggressive” portfolio is 95% in US Stocks and 5% in Cash/Money Market Funds. The aggressive portfolio owns no fixed income securities. To these baseline portfolios we then add a Gold component following a rough guideline of various investment strategies to come up with new weighted average asset allocations (Source: Gold IRA Guide rollover allocations). Figure 2, below adds a 5% Gold holding to each of the three baseline portfolios. Figure 3 depicts a second Gold holding of 10%, and Figure 4 illustrates the change in the three baseline portfolios after a mix of 25% Gold is added to each. The next step in our study was to compare annual returns of each of the twelve portfolios going back to 1972. Because the intent of our work was to determine if the addition of investments in Gold would be beneficial to an IRA, we did not deduct taxes from the returns of our hypothetical portfolios. The logic behind this is that IRAs offer a tax-deferral on any gains earned prior to withdrawal at retirement. This is significant given that our methodology rebalanced each portfolio annually to maintain a constant year-over-year weighting between the various asset classes in each of them. This rebalancing would have subjected a non-qualified account to taxable gains and losses. Also, absent from our return study is inflation, which would have had a further negative effect on absolute returns over time. As a result, the returns noted herein are before taxes, inflation, and applicable fees that one would expect in a real world scenario. Between 1972 and 2015 the baseline portfolios (Conservative, Moderate, and Aggressive) would have grown at compound annual growth rates (CAGR) of 7.38%, 8.53%, and 9.97%, respectively. This means that a $1 million investment in each of the three portfolios would have grown to $22,960,826, $36,713,972, and $65,602,070, respectively over the forty-three year span of our study. Yet, as Figure 5 below points out, these returns are enhanced as Gold is added to the mix. Table 1 below illustrates how each of the portfolios benefits by the inclusion of Gold. The CAGR of each portfolio is reflected in Table 2 and demonstrates that each one’s total return improves when Gold is added to the asset mix. As Table 2 demonstrates, the inclusion of Gold in each of the baseline portfolios has a net positive effect on performance. But, what affect does adding Gold to a portfolio have on risk? Strategic asset allocation is intended to maximize long-term investment returns by mitigating the risk of loss during periods of short-term underperformance of differing classes of financial instruments. For example, stocks and bonds will not behave the same way in a given market environment, so their total returns during such periods won’t be related to one another. And, traditionally portfolio managers have relied on the theory that a mix of stocks, bonds, and cash can mitigate the long-term standard deviation (risk of variation) of a portfolio’s returns because the various asset components are not positively correlated (Source: Robert D. Arnott, CFA Institute, “Asset Allocation: The Challenges and Opportunities of Implementation”, 1987). In this context, our baseline portfolios demonstrate unique risk profiles. Adding Gold to each of them changes those profiles. And, as is seen in Table 3 below, with just two exceptions, that change is positive. The two scenarios in which portfolios do not benefit from increased exposure to Gold are the Conservative and Moderate mixes. But, this happens only when the Gold exposure increases from 10% to 25%. The increase in standard deviation from 7.30% to 8.52% for the Conservative portfolio and the change from 7.41% to 8.24% in the Moderate portfolio happen because adding the additional Gold exposure comes as a result of losing exposure to each portfolio’s least volatile asset (10-Year Treasuries). In every other case, the addition of Gold serves to decrease risk in all three baseline portfolios. Gold investments have traditionally been seen as a hedge against declines in the value of “paper” assets (stock and bonds). As such, we endeavored to see how each of our hypothetical portfolios would have fared compared to the baseline portfolios under various micro-market conditions. We sought to determine if the portfolios that included Gold had any kind of return advantage over the baseline portfolios during stock market downturns. To do this, we looked at the five worst years for equity performance between 1972 and 2015. In each of these five years, the baseline portfolios all outperformed the US Stock Market. The returns of the Conservative portfolio ranged from a loss of -0.34% in 1973 to a gain of 12.54% in 2008. The portfolio’s small equity exposure helped mitigate a loss in 1974 and its much larger exposure to fixed income securities is responsible for its gains in 2001, 2002, and 2008. Interest rates were declining in each of those years and that helped increase the value of the portfolio’s fixed income securities since bonds move inversely to changes in interest rates (Source: Federal Reserve Economic Data). The Moderate portfolio saw losses in each year except 2002 when it incurred a slight gain of 1.82%. The portfolio’s biggest loss was in 1974, coming in at -7.98%. The Moderate portfolio’s greater exposure to equities is to blame for the losses. And, then as one might expect, the Aggressive portfolio with its significant exposure to stocks and no fixed income investments had losses in each of the five one-year periods. Losses ranged from -35.11% in 2008 to -10.23% in 2001. While it wouldn’t have been much consolation to an investor holding this portfolio, it is well to point out that on an absolute basis, the baseline Aggressive portfolio still outperformed the US Stock Market in these down years. For the most part, including Gold into each of the three baseline portfolios improved their returns in nearly all five periods. There are only two exceptions when adding Gold to one of the portfolios did not improve its returns. The portfolio is the Conservative mix and the years in which the baseline portfolio outperformed the other three allocations (5% Gold, 10% Gold, and 25% Gold) were 2001 and 2008. As can be seen in Figure 6 below, in every other case, the addition of Gold into the portfolios improved their total return in each of the five one-year periods. The return numbers for each portfolio are detailed in Table 5 below. As Table 5 illustrates, most of the portfolios benefited from the addition of Gold to the mix, even in those years where the total return was still negative. In general, the portfolios that included Gold outperformed those that did not. But, would this be the case in years where equities advanced in value at rates higher than their historical mean? To determine this, we looked at the five best performing one-year periods between 1972 and 2015. Those years were 1975, 1980, 1991, 1995, and 2013 (see Table 6). In each of the five best years for the US Stock Market, the baseline portfolios underperformed the benchmark. The fact that the three baseline portfolios were diversified across different asset classes is the reason for this. While the equity component of each portfolio performed in line with the US Stock Market in each of the five one-year periods, it was their asset allocation that tempered their total return in those years. So, even before Gold is added to each mix, the baseline portfolios begin at a disadvantage. Surprisingly, this trend remained mostly in tact as Gold was added to each portfolio. There were two exceptions. In 1980, Conservative and Moderate portfolios that also included Gold did outperform their baseline counterparts. But, in every other case, portfolios with Gold underperformed the US Stock Market and their respective baseline asset mix (see Figure 7). The return numbers for each portfolio are detailed in Table 7 below. As Table 7 points out, with the exception of the Conservative and Moderate portfolios in 1980, Gold did nothing to enhance returns in any of the other years for any of the other portfolios. A possible explanation for this is the very reason Gold is used as a hedge against paper assets. In general, Gold is not positively correlated with stocks or bonds. And 1980 appears to be an anomalous event. Typically the three asset classes move in different directions, as Table 8 below convincingly illustrates. Within the span of the forty-three-year history of our study, there have been six significant stock market disruptions in the United States. Also in 2001, the US suffered its worst ever incident of terrorism on September 11th. That year saw the Dow Jones Industrial Average lose approximately 7% of its value while Gold held steady and gained slightly more than 1% on the year. On Friday, October 13, 1989 US stocks lost nearly 7% of their value in one day. This “Mini Crash” has been cited as an important cause of the early 1990s recession. Yet, from October 13, 1989 through the end of that year, Gold prices rose nearly 9.8%. The first was the Bear Market that began in January of 1973 and continued for nearly two full years. During this time US stocks sank some 45%. Yet, between January 1973 and December 1974, Gold nearly tripled in value. The stock market crash on October 19, 1987 represented a 22% loss in value in one day, the worst since the panic in 1929. For the full year 1987, Gold prices rose 24.46%. When the dot-com bubble burst on March 10, 2000 it precipitated a Bear Market that would last about two years. By December 31, 2001 the NASDAQ Composite Index had declined 62%. In those same 21 months, Gold prices held somewhat more firmly closing down just -5.34%. Before Lehman Brothers collapsed in 2008, US stocks were already in the early stages of a Bear Market that began on October 11, 2007 and lasted at least until June 2009. During that period of time equity markets lost more than 42.6% of their value and Gold rose more than 24.7%. Even though US tax laws changed in 1997 allowing Americans to own Gold in an IRA, it does not appear as if a majority of savers have taken advantage of the rule. According to the Investment Company Institute less than 2.5% of the assets in Individual Retirement Accounts appear to be invested in Gold. In our view, this creates a huge opportunity for investors. The opportunity may be even more compelling given that, based on our analysis; the addition of Gold to an IRA more often than not enhances portfolio returns. Importantly, this incremental boost in return does not come with a burden of additional risk, especially over long periods of time. Our analysis shows that adding Gold to a well-diversified durable portfolio of stocks, bonds, and cash actually reduced the portfolio’s risk of loss over the long haul. While there will continue to be periods where stocks and bonds outperform Gold in the short-term, and occasions when the precious metal may actually be a drag on performance, our work supports the notion that its inclusion does more good than harm. This is especially the case during periods of stock market disruption. Empirically, the addition of any other asset class to an all-equity portfolio necessarily reduces its return over the long-term. This is indeed the case with fixed income and cash assets. The corresponding benefit of their inclusion, however, is risk-mitigation. Interestingly, our work did not find that adding Gold to our baseline portfolios reduced their return. It was quite the opposite, especially over long holding periods. More importantly, adding Gold augmented total return in a meaningful way regardless of where one rests on a risk tolerance continuum between conservative and aggressive. In our opinion, the addition of Gold in a retirement account makes sense. But investors are cautioned to be diligent when it comes to portfolio management. Gold needs to be considered in the context of one’s investment objectives and time horizons. And, it needs to be evaluated early on in the portfolio construction phase of retirement planning. Considering Gold in one’s retirement account needs to be weighed against the risk and return attributes of competing assets. One cannot own everything. However, our view is that Gold ought to be seriously considered as an appropriate component of every strategic asset allocation. In addition, methodic, periodic rebalancing is imperative to achieving the type of long-term portfolio results that we observed in our study. Anthony Termini is the Managing Partner of Beta Capital, LLC, a private hedge fund in Reno, Nevada. He began his investment career in the mid-1980s at Kidder, Peabody & Company’s Private Client Group. After nearly 20 years in San Francisco with stints at Bear Stearns and Merrill Lynch, Tony joined Kochis Fitz (now Aspiriant), one of the largest independent Wealth Management firms in the country. He contributed to the books Wealth Management: A Concise Guide to Financial Planning and Investment Management for Wealthy Clients and Diversify or Die: Diversity. Inclusion. Evolution. Success and is a frequent contributor to many financial publications. Sources for pricing on specific dates referenced in this section were obtained from Intercontinental Exchange, Inc., NYSE Market Data, Facts & Figures: Interactive Viewer, Stock Price Trends and the US Geological Survey, Metals Prices in the United States Through 2010. Eleven years ago I retired from the investment business after spending the majority of my adult life in the industry. I have been a Registered Options Principal, a Series 7, Series 8, Series 63, and Series 65 broker. My clients included insiders at public companies and other accredited investors. My work included constructing and selling derivative swap and collar positions in addition to managing client portfolios. What are the taxes on the gain in a gold account. How does that change if gold is in a Roth IRA.